A revolutionary cleaning process - Pure Liquid Silicone - The future of dry cleaning? relaxx Dry Cleaning in San Diego, CA is one of the new wave of dry cleaners offering a more eco-friendly, and state-of-the-art dry cleaning facility. Unlike traditional dry-cleaning, which uses perchloroethylene or “perc,” a petroleum-based solvent, the GreenEarth process uses no hazardous chemicals. It cleans with pure liquid silicone, basically liquefied sand, the same gentle, natural product used in many everyday shampoos, lotions and deodorants. With GreenEarth, there is nothing to dirty the air, contaminate the soil or pollute the water, and the results are noticeable better. One of the most noticeable differences with the GreenEarth® process is the lack of that telltale “dry cleaning” odor. The benefit to clothes is also tangible. “Garments just look and feel better,” said William Jones, General Manager of relaxx Dry Cleaning. “They are softer, with more body; colors are brighter and whites whiter.” Additional benefits for customers include no dye-bleeding or damage to delicate beads and trim. relaxx Dry Cleaning's choice to install the the environmentally safe cleaning system was due to the 2007 Californian ban on perc and it is a decision that puts them ahead of the curve. 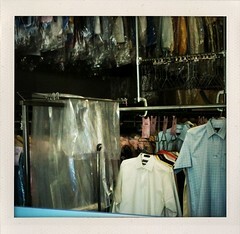 If you would like to know more about dry cleaning practices in Hampton Roads, contact Mark Pressed4Time today.